Selfridge – Selfridge Air Force Base is located on the U.S. side in the northern part of Lake St. Clair. It’s possible that when someone says they were fishing “Selfridge” they were anywhere in the bay by the base but it’s most likely they were in the south west corner near the base itself. After 9/11 there was a 1/2 mile zone that was marked off limits with yellow buoys. That has since been taken down. The Sturgeon Hole – Of all the Sturgeon holes in all the world, this is the most likely one that people are referring to. If you are having the conversation with someone who is pointing you in the direction of the “Sturgeon Hole,” better get the part of the river or even better yet, which river they are talking about. Those anglers who don’t fish the Detroit River have their version up in the St. Clair River and might not think to mention that. Mitchell’s Bay – Although Mitchell’s Bay is in the far north east corner of this part of the Lake anglers who “caught their fish in Mitchell’s Bay” could have been fishing anywhere out in front too. The convention here is as long as you can see Mitchell’s Bay, you were fishing it. The Stakes – The stakes that surround the First Nation Territory are a visible boundary which to fish inside of it, requires a separate license. 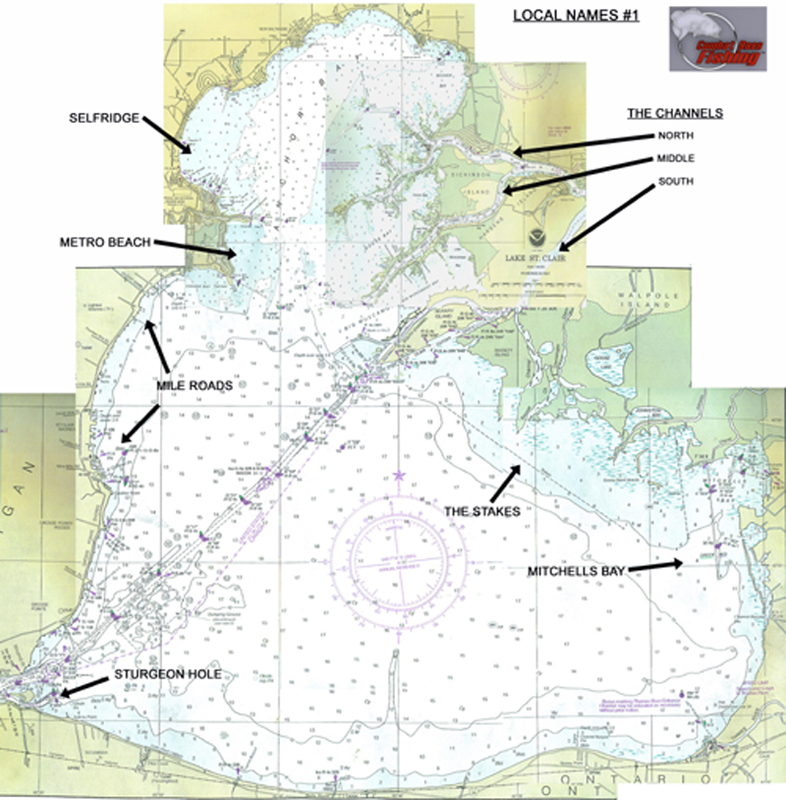 The area marked with “stakes” goes from the Lake, up the South Channel of the St. Clair River and down the Chenal Ecarte. When an angler talks about “fishing The Stakes” though they are referring to the long line of stakes in the Lake. The Channels – At the end of the St. Clair River it splits into three main channels: North, Middle and South. If someone is “fishing The Channels” it almost always means they are fishing in one of those. If they are above the point where the river splits into the North and South Channel then it is normally said that they are fishing the river. This entry was posted on May 9, 2010 at 7:10 AM and is filed under BTTF News. You can follow any responses to this entry through the RSS 2.0 feed. You can leave a response, or trackback from your own site.